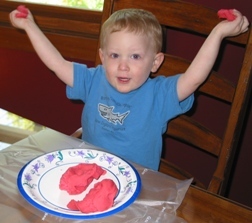 Cook up a batch of Fun Dough and watch your children's imagination go to work. This dough has a smoother, softer consistency than store bought dough and is non toxic. 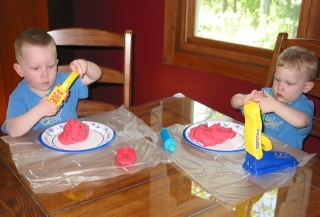 Once you use this play dough, you will not want to go back to the store bought dough. In a bowl, mix together the flour and cream of tarter. Set aside. Combine the water, oil and a few drops of food coloring* in a 3qt sauce pan. Heat on medium just until warm. Then, add the dry ingredients and stir quickly. Continue stirring and cook on medium/low heat for another minute or two until the dough pulls away from the side of the pan. Remove the mixture from the pan and knead it on a lightly floured surface until it is smooth. Cool completely before giving it to children to play with. * For darker colors add more food coloring and use less food coloring for lighter shades. For a longer life, between uses store in the refrigerator in a tightly sealed container or in a re-sealable plastic bag with the excess air squeezed out. Idea: For an inexpensive gift, make some dough in different colors. Place each color in it's own disposable container and pair it with a mini-rolling pin and some cookie cutters. For an added bonus, print the recipe and include it with the gift. Liam and Declan enjoying their homemade dough.